I was talking with my friend Chinot when she mentioned that she had made pancakes today and suggested I make some too. I completely forgot about Shrove Tuesday and the tradition to make pancakes on this day. When I was living in Moscow in the early nineties, this day was called Maslenitsa and was always celebrated with lots and lots of sweet and savoury blinis, the Russian pancake, being made and eaten. 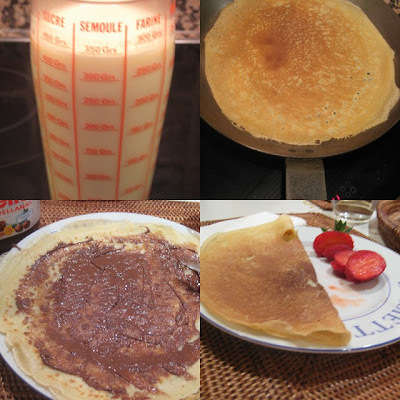 It seems that Shrove Tuesday became pancake day as a way to get rid of all milk, butter and eggs, (rich ingredients to be avoided during the Lenten season), on the day before Ash Wednesday. Anyway, my son was really happy with the surprise crepes and we finished the full recipe, at least two crepes each, for dessert. The recipe is easy and even more convenient to make if you have one of these special French measuring cups with the ingredients already listed on the side in gram weight to avoid having to use a weighing scale. I also used a 12 cm. cast-iron blini pan instead of the traditional 22cm. cast-iron crepe pan. Happy Pancake Day! Sift the flour and salt into a bowl, make a well in the center and add the eggs. Gradually beat in the flour from all sides and slowly pour in the liquid, to make a smooth batter. Sieve, if necessary and cover and let rest for at least 30 minutes or overnight.